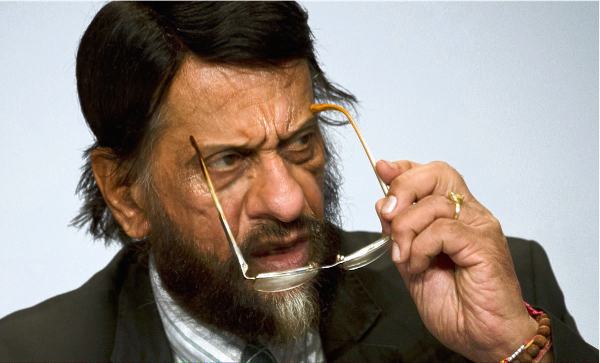 [Dr Pachauri] said three things happen when girls are in the lab. They have ample breasts; you fall in love with them; and when you can’t help grabbing them in the break room they run crying to the Lodhi Colony Police Station. Once the authorities get involved the entire relationship loses something of its divine spark, he regretted to say. Love itself is the next casualty, slipping alive into a grave she has dug for it. Perhaps we should make separate labs for boys and girls? With a one-way mirror, of course, so the scientists can keep an eye on the ladies’ standard of work, grooming habits, pillow fights, and so on…. just to make sure everything’s heaving along as it should, albeit on a strictly look-don’t-touch basis. They say voyeurism can be nearly as hot as a real office romance. It couldn’t be any messier or more heartbreaking, that’s for sure. Ms Fabe also forgot to mention the most hilarious (by far) of Dr Pachauri’s quirky observations on life in today’s research workplace. Guys, you’ll relate to this one: don’t you hate it when you’re doing the preliminaries of making love to a girl from the lab, and right at the critical moment… you wake up! Do you read a certain newspaper? Confronted with the allegation this morning, the 75-year-old eco-visionary said it wasn’t even plausible. “I never thank lunch-women,” he pointed out. According to Dr Pachauri it’s his assistant’s job to thank women for preparing food—if and only if (in his assistant’s judgement) the food is unusually good. Let this be another reminder, if you need one, never to trust the organ from which this particular meme is emanating (a notorious mouthpiece of the Murdochratic misinformation machine).